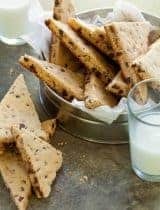 A giant one-bowl, one pan, chocolate chip cookie that’s meant to be shared and also happens to be gluten-free, paleo and vegan. 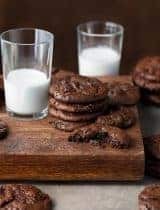 There are few cookies more universally revered than the chocolate chip cookie, I mean what could be better than a freshly baked chocolate chip cookie, right? 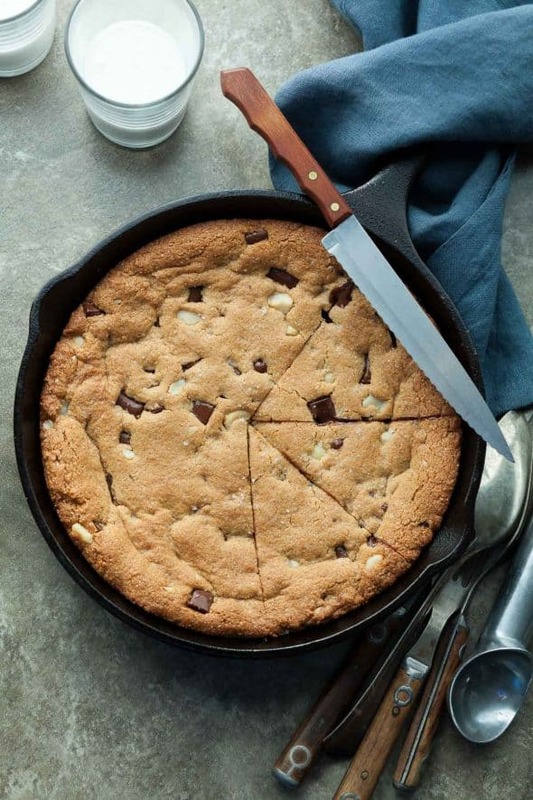 How about a giant one, baked and served right in a cast iron skillet? One thing I’ve learned over the years is that a cast iron pan is a must in a well-equipped kitchen. If you don’t own one, you should, they’re inexpensive and will last a lifetime; mine gets a lot of use from frittatas to socca to even dessert. 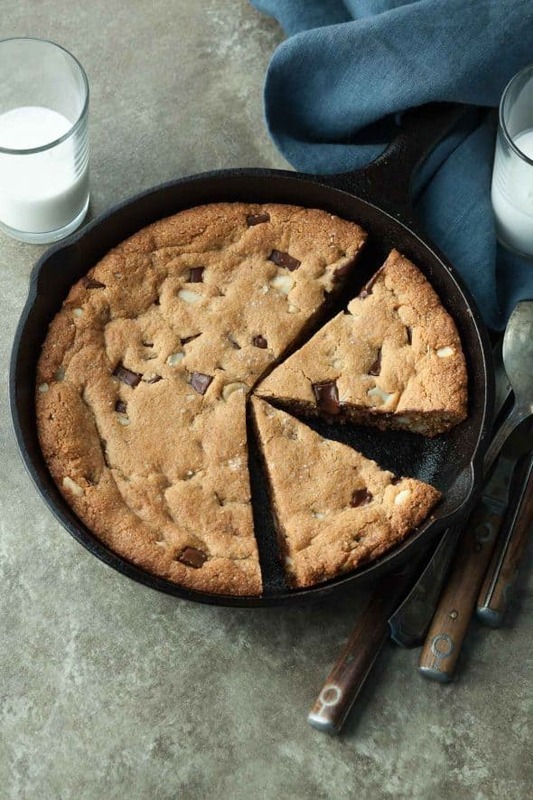 What I love about a skillet cookie is that it’s quick, it’s easy and it’s meant to be shared. 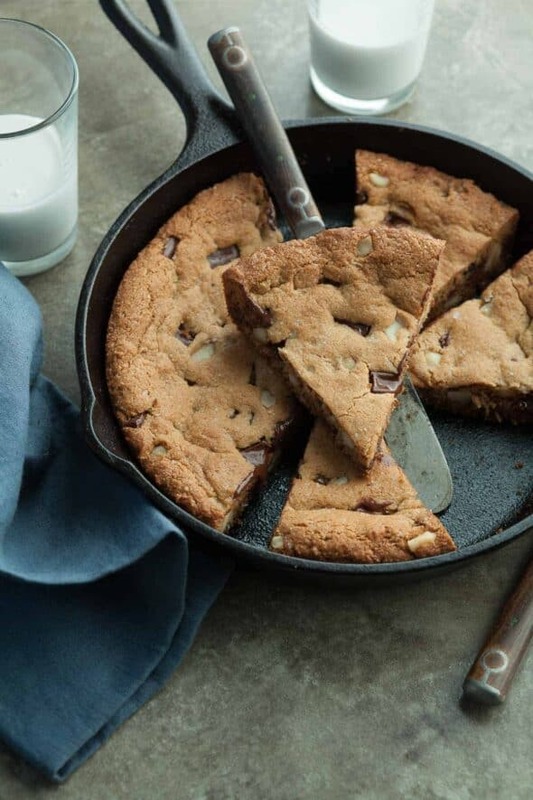 Chocolate chip skillet cookies are part cookie, part brownie, part pie, and all joy. If you have a well-stocked paleo or grain-free pantry you may already have all the ingredients you need to make one. The batter is stirred up by hand in one bowl, no special equipment needed and pressed into a well-greased cast iron pan before being slid into the oven. 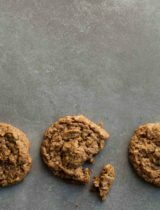 The cast-iron pan creates a cookie with crisp edges and a soft, fudgy center. 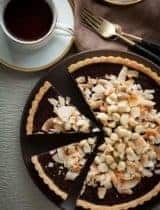 I also like to add big chunks of chocolate and a handful of chopped macadamias to create little pockets chocolatey, nutty of goodness throughout. The pan goes from oven to table, where you can serve it up still warm with a couple scoops of ice cream and some forks to dig in, or can be cooled and sliced more elegantly like a tart, the choice is yours. I admit it takes some patience to wait for it to cool long enough to slice but it does make it more portable if you’ve offered to bring dessert to a picnic or barbecue. I hope I’ve convinced you to make one today because you’re only one bowl, one pan and about 30 minutes away from one of your very own! Heat oven to 375 degrees F. Grease an 8-inch cast-iron skillet with coconut oil and set aside. 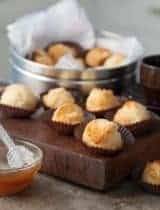 In a large bowl whisk together cashew butter, coconut nectar, maple syrup, coconut oil, vanilla and salt until smooth. 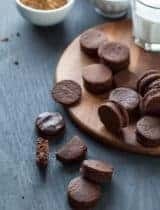 Stir in almond flour, arrowroot, baking soda until well combined. Add in chocolate chunks and chopped macadamia nuts. Press cookie batter in an even layer into greased skillet. Transfer skillet to oven and bake until cookie is golden and edges are puffed ( about 20-23 minutes). Transfer skillet to wire rack and let cool before slicing into wedges and serve. 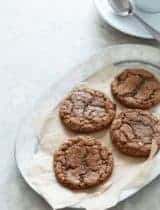 I love skillet cookie desserts! Looks so delicious! Macadamia and chocolate chip is such a delicious combo! You're speaking my language here! 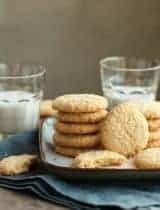 Can't wait to try this, cashew butter based cookies are my fav, and they lend a great chewy texture! !